Blue nose pit bulls are a very special and rare breed of dog. Although their origin is unknown, blue nose pit bulls are believed to be a product of a genetic defect that can be caused by interbreeding. These pit bulls are best known for their bluish gray coat, which is not standard amongst this breed. 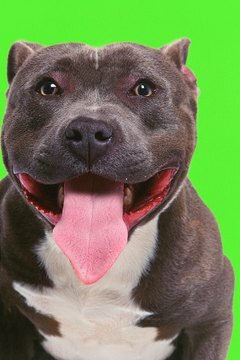 Although pit bulls have a reputation as being mean and violent dogs, with the proper care and training your blue nose pit bull will be a calm, affectionate and well-mannered addition to your family. Feed your dog a diet a high quality food and provide it with a constant supply of water. If you are unsure of what type of food to feed your dog, talk to your veterinarian as every dog has different dietary needs. You should also use dog treats as a training tool. Be consistent from day one. The second you bring your new puppy (or even adult dog) home, you must be consistent with your training methods. For example, if you don’t want the dog on the furniture make sure everyone abides by these rules. It is important that all members of the family are on the same page or your pit bull could assert its dominance over some members of the family. Exercise your dog every day so it burns off energy and is less likely to be overactive in down time. Blue nose pit bulls are notorious for being high-energy dogs. They require at least 30 minutes of daily exercise. Walking your dog is also a bonding experience and a good time to train it how to walk properly on a leash. Take your dog to puppy obedience classes. These classes will not only help teach your pit bull basic commands such as sit, stay and leave it, but puppy classes are a great way to socialize your dog. Pit bulls are generally quite friendly with other dogs, but they must be properly socialized to develop this skill. Also, teaching your dog commands will help you in your day-to-day dealings with your pit bull. Provide your pit bull with lots of toys and activities to keep it busy throughout the day. A bored pit bull is a destructive pit bull — if they are left alone for long periods of time, pit bulls can get bored and chew your belongings. Pit bulls have very strong jaws and teeth and will need to have very tough toys to keep them occupied. Keep your dog’s vaccinations up to date and schedule annual checkups. Because Blue nose pit bulls are a product of genetic mutation, they are susceptible to more illnesses than other breeds of dogs. For this reason, it is important to take preventative action by scheduling regular vet visits. Buying a pit bull is not something that should be taken lightly, given their already tainted reputation. If you get a pit bull, make sure you are prepared to spend a lot of time training and socializing your pet to ensure it is a well-trained and friendly dog.